The connection between mortality and tattooing has frequently come up as a theme in my research. If, as Sontag writes, photographing people necessarily involves us in their mortality, can a similar claim be made for tattooing? It seems to me that both the painful nature of the process, and the permanence of the tattoo, share similar affinities with death and the passage of time as the photograph. Both the tattoo and the photograph are attempts to record experience, to render permanent some transient moment of our lives. Whilst a photograph may last a hundred years, tattoos usually die with us; though of course these too may also be ‘sliced out’, preserved chemically and frozen in time. The tattoo is a memory etched in flesh – a memento which, at the very least, stands as a reminder of the very process of becoming tattooed, of the events and thoughts that led to the decision to undergo the needle and permanently change the landscape of the body. The pain, wounding, healing, and permanence; all these things combine to reassure us of our corporeality, our fragility. The experience of being tattooed reminds us that we are alive. It is an extension of the skin’s innate ability to register and record life events, to sense and feel and connect us intimately to those around us; mapping out our experience in scars, wrinkles, lines, ink. The tattoo differs from the natural wear of age only in the conscious act of its inscription. One of the most readily apparent links between the tattoo and mortality can be seen in the memorial tattoo, which is typically acquired by an individual seeking to commemorate the life of a loved one. In this case, the tattoo provides a kind of corporeal anchor with which to fix emotional experience and the memory of a person lost; sometimes even incorporating part of the deceased themselves, through adding cremated remains to tattoo ink. But it is the experience of our own mortality and tattooing which interests me – a union that finds particular expression in the memento mori tattoo. A quick Google search will attest to the popularity of this particular tattoo motif. Styles and inspiration for these kinds of tattoos comes from many pictorial traditions, including the vanitas tableau and Mexican Día de los Muertos imagery. 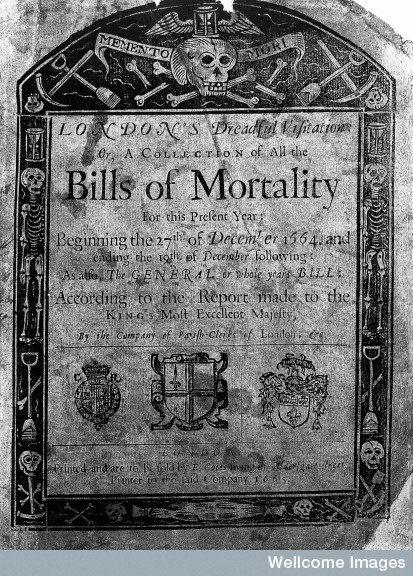 Recently, I came across a contemporary example of a memento mori tattoo with a particularly interesting visual source: the Bills of Mortality of 1665. Appropriately, the tattoo belongs to Sarah, a History of Medicine research student in London. I had it done the week before I turned 30. In part it was mocking, because I’d always felt 30 was going to be an ominous milestone, but in the event it turned out being the opposite of what I’d anticipated in my early to mid-20s. In fact, lots of things in my life seemed to be coming together (including the PhD funding, which made a history of medicine theme seem particularly emblematic!). I’d struggled with a lot through my 20s, and to me the memento mori became an emblem of survival. I’ve always found cemeteries and memorials of similar kinds both powerful and strangely comforting: in perhaps a reverse of the traditional religious sense, it’s always seemed to me that the proximity of death can often serve as a reminder that life is worth living. I think for a long time I’d expected to think the opposite when I turned 30, so it was nice to pass through it in hope. For me, one of the most intriguing things about the Wellcome Collection tattoos is that all of them, in some way, may be considered to be memorial tattoos. Even those that were not explicitly conceived by their bearers as memento mori tattoos, may become so for those who view them today. As fragments of the long-lost lives of others, like photographs, they implicate us in their mortality, and remind us of our own. 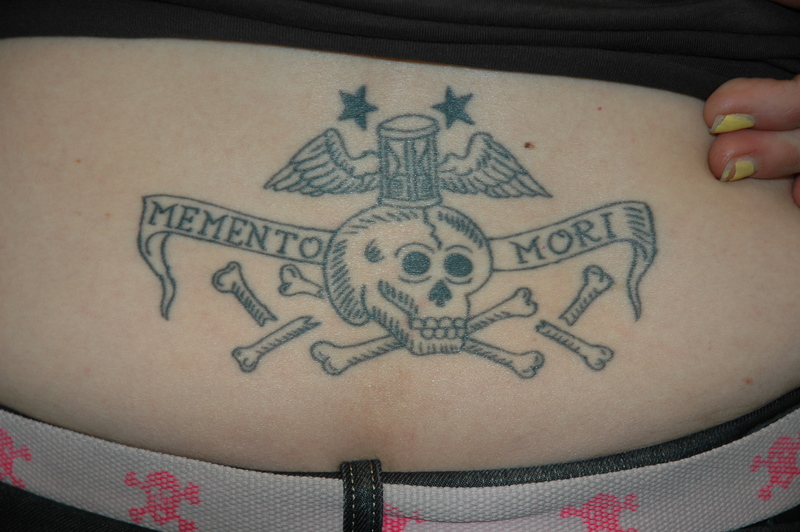 Do you have a memento mori tattoo? Please send me your images and stories, detailing where, when and why you chose the particular design to gemma.angel.09@ucl.ac.uk, and I will publish as many as possible on my blog! (Please note that photographs must be your own, all photo credits will be acknowledged). For more information on the practicalities of using cremated remains in tattooing, visit the Death Reference Desk. This entry was posted in Tattoo Iconography and tagged cremains in tattoo ink, human remains, images of death, memento mori, memorial tattoos, memory, photography, skin, tattoo. Bookmark the permalink.